I’m also wondering, “Has anyone considered this before? Then I made a list. The only hard rule is that it must be a single person, so while it might be tempting to nominate an entire animation studio, I’m going to limit this to single human beings. 1.) Bruce Timm. This seems like a no-brainer, and it kind of is. For all the praise I’m about to throw toward writers and actors and so on, the single most striking element to this series has always been the style. With that as a starting point, all other things fell into place. 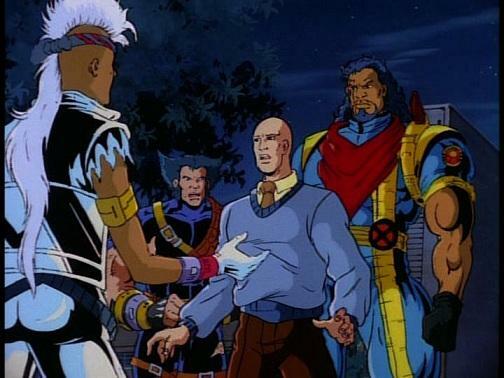 I believe that if the visual style had been standard (think 1990’s “X-Men” cartoon), then the style of the entire show could have/would have faltered. Think of it this way: Timm wanted a dark noir style to the show in both visuals and storytelling. But what if he had character designs too difficult to animate to accommodate that style? What if there were more lines on Batman’s chest, or more patterns on Two-Face’s jacket? Then it might not have been as easy to cast light-source shadows across those characters, thus hurting the noir-ish style. Lots of people made “B:TAS” great, but I think they were allowed to reach greatness because the visual scheme of the show inspired and supported them. That’s all Timm. 2.) Andrea Romano. My first cheat! I said I wasn’t going to nominate teams, and while I’m technically not, by nominating the casting director, I am — in a way — nominating the great cast. Taking the cue from the visual style presented, Romano cast actors who would act realistically. Compare this to, say, the 1990’s “Spider-Man” cartoon* with its wall-to-wall dialog, and wall-to-wall BIG dialog). Romano worked with actors in a room, acting together, and even though she had some choices that could have qualified as stunt casting, the voices all supported the storytelling. 3.) Paul Dini. Arguably the break-out star of the series, as he created the true break-out star character in Harley Quinn. It almost broke my heart not to rank Dini higher on the list, as he was personally responsible for more of the best “BTAS” episodes than any other writer. Nobody knew how to use humor in this show like Dini, and nobody’s jokes were quite as funny. He used humor for irony (as in “Heart of Ice”). 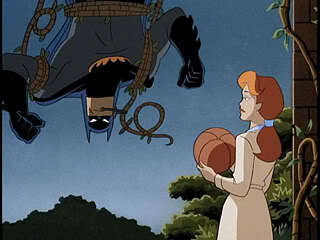 He used it to ease tension (as in “Harley & Ivy”). He used it to just plain write comedy episodes (as in “Joker’s Millions”). In the rare instances where a villain wasn’t clicking — such as the early Penguin and Catwoman entires — I remember thinking, “I hope Paul Dini gets to write one for them.” And he would. An they are all easily superior. Dini’s tone fits the fun of comics. Even when things are tragic, they are first and foremost entertaining. If we’re carrying the current NBA comparison through, this makes Dini the LeBron James of “B:TAS.” He’s so obviously the best that people almost get tired of bringing it up. That one’s in the day light, and it feels darker than the X-Men night scene! 5.) Shirley Walker. I feel like I don’t know enough about composing to make a fully-formed opinion about Shirley Walker’s work. And, once again, I may be nominating a crew with this one. But I know how music makes me feel, and how great music makes me feel, and how it ties itself to the movies. It is essential to the success of a show. No question. For an example of how music can have a negative impact, try playing the Lego Batman game. They only have music from the 1989 “Batman” movie, and while it’s not technically “bad” music, it is tedious. And as I played the game, I turned off that music and turned on Shirley Walker’s music. And “The Dark Knight” soundtrack, but we’re not talking about that. 6.) Mark Hamill and 7.) 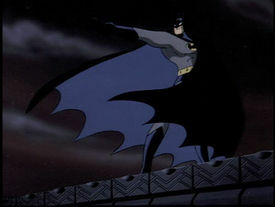 Kevin Conroy. In “The Book of Basketball,” Bill Simmons ranks all the players in a tier system. When he got to Karl Malone and Charles Barkley, he put them one after the other, and wrote about them as a couple due to their many similarities, then discussed what made them different. I’m doing the same thing here with Hamill and Conroy. Both voices have lived on as the voices that live in our heads while we read the Joker and Batman. Both are surprisingly effective. But I think I rank Hamill a bit higher in terms of the “B:TAS” MVP race because the decision to cast him as the Joker was such a big part of the lead-up buzz (as in “You’ll never guess who is voicing the Joker! LUKE SKYWALKER!!!”). If they’d done the same headline for Conroy, nobody would have actually guessed. So in a way, whatever interest Luke Skywalker’s relationship to this show may have helped the show more, at least in the beginning. That’s not to diminish Conroy’s contribution, and I would actually argue that if this were a race for the MVP of the Batman LEGACY, then Conroy would go higher. Agree? Disagree? This is the internet — of course you agree. *The 1990s were not a great era** for Marvel animation. I don’t mean to come off as a Marvel hater, but both these shows were so blandly run-of-the-mill that they actually stood out for their blandness by comparison to “BTAS.” This must have been how music fans felt about Journey once “Nevermind” hit it big. **Not that this current era is much better. And not that it’s bad, but I find current Marvel animation tedious. I tried to watch “Ultimate Spider-man,” and it’s basically Avengers-Lite. Why does Spider-man need to get teamed up? Why give him super-tech and a motorcycle? And Dini’s invovled with it, so it’s not baaaaaaad, but it just kinda blands out the whole thing. There’s lots to like on “Ultimate Spider-Man,” but I’m tired of the team thing.